It’s easy to take for granted just how grand and magical television is right now for comic book fans, as the medium is embracing everything from superhero stories to post-apocalyptic epics to Red Sonja. Two unlikely leaders of the cause are Seth Rogen and Evan Goldberg, who are currently gearing up to bring Garth Ennis’ iconic series Preacher to AMC. But before that can even come out, the duo have already locked down their next project, an adaptation of the celebrated and super-violent comic The Boys. There will be no worries about any censorship from this one, as Cinemax is the network putting it in development. So hard to type while I’m just continually pumping my fists in elation, but we’ll get through this together. At this point, The Boys is in the earliest stages of being put together, and Cinemax hasn’t actually put in any kind of a series order or anything. (But how bad would it need to be to get them to pass?) For this project, Seth Rogen and Evan Goldberg are once again working with producer Neal Moritz, but they’ve also looped in another creative mind in Eric Kripke, the creator of both Supernatural and Revolution. The trio developed the project together, while Kripke will be handling the writing duties. And according to Deadline, Rogen and Goldberg will get behind the camera to direct. 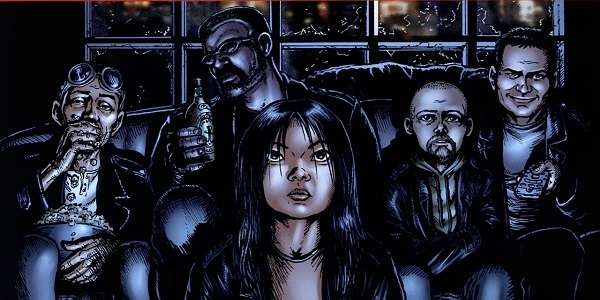 Written by Garth Ennis and illustrated by Darick Robertson, The Boys has been called an anti-superhero tale, as it focuses on a set of black ops CIA agents, dubbed The Boys, who are tasked with keeping a close eye on the country’s superpowered citizens, as most of them have become ego-driven celebrities whose behavior and demeanor are not representative of their heroics. And because the titular squad also has powers, they can indeed corral the more rambunctious heroes out there, often using as much force as is needed and then some. And yes, there's a woman in the group. The series lasted for 72 issues from 2006-2012. The first six issues were put out by DC’s Wildstorm imprint, but the parent company canceled the title due to its dark tone, so The Boys then shifted over to Dynamite Entertainment for the rest of its boundary-pushing run. To be expected, this is hardly the first time that someone has tried to turn this series into a live-action project, with director Adam McKay getting attached to a film version back in 2010 before it flipped from Columbia to Paramount. It was last October that Rogen, Goldberg and Kripke started shopping the project around, with the premium cabler Cinemax coming out the victor. Well, viewers will be the real victors if it gets picked up to series. While it’s not set to premiere on AMC until May 22, Preacher has already gotten some great early reviews from those who have seen the pilot, and Rogen and Goldberg have been talking a good game about the violent drama ever since they got attached. And really, it looks awesome. Can they strike gold again with The Boys? Only time will tell, I guess. But seriously, someone get Simon Pegg in there as Wee Hughie Campbell. That’s who inspired the character, and that’s the only person who should play him. Period.